3 bedroom/2 bath 2 LEVEL end unit town home. WIFI, wireless internet. 2 HDTV'S and 1 DVD/VCR. Deck with furniture. WASHER/DRYER, MICROWAVE and DISHWASHER. Queen in master bedroom on entry level, queen and 2 twins downstairs. 65 CHANNEL CABLE with Golf Channel. Very nice, updated furnishings. End unit. Grill not available. Hot Springs Village Is a gated community located about 15 miles north of Hot Springs. 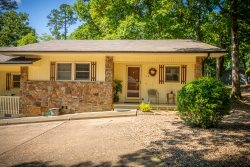 Enjoy golf, fishing, swimming, tennis and hiking trails in the heart of the Ouachita Mountains. DESOTO GOLF COURSE AREA 1 1/2 MILES FROM THE WEST GATE.